1) Teams must be in alignment with God’s purposes if we’re going to be like-minded (Phil. 2:1-2). Trying to build a team around our own agendas isn’t a high enough reason. It’s not about bringing people into agreement with one another but with God. 2) Team members must function interdependently, not independently. Everyone looks out for the interests of the others (Phil. 2:3-4). Trying to build a team without valuing and looking out for each and every member will weaken the whole, rendering it less effective. 3) Teams must exercise Christ-like character toward one another in order to have the humility and servant heart needed to lay aside personal agendas and lone ranger attempts. Philippians 2:5 begins, “In your relationships with one another, have the same mindset as Christ Jesus.” He is our model, our example, for healthy relationships. 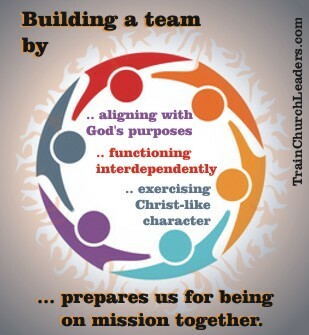 Hence, Christ-like character must be exercised if we’re going to have effective teams. Notice how being a servant required Jesus to lay aside His rights. As God Himself, Jesus could have approached relationships from a controlling stance insisting everyone cater to Him and follow Him whether they wanted to or not. Yet, He stooped to wash the disciples feet and focused on meeting the needs of others. And, He did not force or manipulate people into following Him. Think about the difference this Christ-like quality can bring to ministry teams. Also notice how Jesus took on “the very nature of a servant.” This was a deliberate, purposeful act in order to bring about a greater good — the salvation of the world. Think about how to purposefully promote this quality of servanthood in the way team members relate to one another. One component to Jesus humbling Himself was acknowledging the human condition. To live as a man, He had to come under the authority of the Father. And so we read of Him doing the Father’s work (Jn. 5:36). We find Him frequently taking time to pray (Matt. 14:23; Lk. 6:12). Ultimately we see Him laying down His life, saying “not my will but your will be done (Lk. 22:42). Think about your own limitations as a human being. Determine if you should be doing a better job of lining up with God and His desire, if you are spending enough time looking to God in prayer as a team. Another component to Jesus humbling Himself was that He got beyond lip service to complete submission to God. Jesus was so sold out to doing the Father’s will that He was willing to not only die to do His will but “even death on a cross” which was a humiliating, excruciating, horrible way to die. He was willing to die this way even though He did nothing to deserve it. Think about whether you’re only saying you want to build a team or if you truly are willing to do what it takes to get there, even if it means personally sacrificing some of your time, perhaps laying aside your own interests and ideas, etc. If we’re going to bring these Christ-like qualities into team-building, keep in mind that it begins with an attitude (“have the same mindset as Christ Jesus”) but ultimately shows itself in practical, tangible ways. This entry was posted in Team Building.